Two churches, the Holy Trinity Roman Catholic Church and St. Paul's Anglican Church in the town of Trinity in the Bonavista Peninsula in Newfoundland, Canada. In the town of Trinity in the Bonavista Peninsula in Newfoundland, Canada you will find many historic churches, two of them being the Holy Trinity Roman Catholic Church in the foreground and St. Paul's Anglican Church in the background. St. Paul's Anglican Church is a wooden structure with arched windows, a chancel, side aisles and a tower and steeple done in Gothic Revival architecture. This church took over 2 1/2 years to build and was officially open in November of 1894. The Holy Trinity Roman Catholic Church is a smaller church as the amount of Catholic people in the town of Trinity are minimal and this church was first erected in 1835. View of the Holy Trinity Roman Catholic Church and St Paul's Anglican Church in the town of Trinity, Bonavista Peninsula, Trinity Bay, Highway 239, Discovery Trail, Newfoundland, Newfoundland Labrador, Canada. 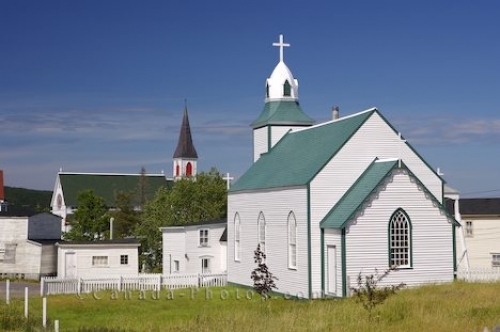 Picture of two historic churches in the town of Trinity in the Bonavista Peninsula in Newfoundland Labrador, Canada.